The field of gifted education is characterized by a perplexing array of perspectives concerning such fundamental issues as definition, identification, curriculum, social and emotional development, and underserved populations. 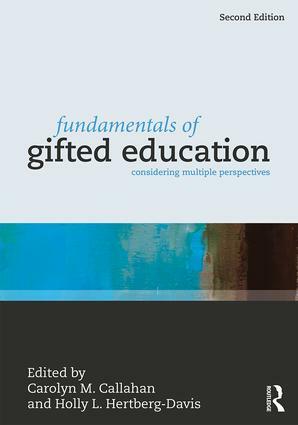 Fundamentals of Gifted Education provides a coherent framework for planning effective programs, providing appropriate educational services, and evaluating programs for the gifted. Parts are organized around fundamental issues confronting the field and follow a common structure: an introductory chapter that provides an overview of the theme of that part as well as guiding points and questions for the reader followed by representative point-of-view chapters written by leading experts that provide varied perspectives on the topic at hand. Carolyn M. Callahan is Commonwealth Professor of Education at the University of Virginia. She has been a principal investigator on projects of the National Research Center on the Gifted and Talented for more than 20 years. She has published more than 200 refereed articles and 50 book chapters across a broad range of topics on gifted education. She is a Past-President of The Association for the Gifted and the National Association for Gifted Children and co-editor of Critical Issues in Gifted Education. Holly L. Hertberg-Davis is an educational consultant specializing in differentiation of instruction, advanced curriculum, and professional development.